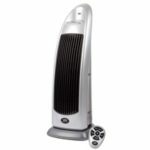 Make sure you stay warm this winter with a space saving portable tower fan heater. Sometimes the central heating indoors is just not enough to keep you warm, but fortunately you can move a tower fan heater closer to you. Perhaps the best tower fan heaters can even save you money on your energy bills, as it can be a substitute for using central heating. If you have an outdoor heater such as a garden patio heater, then some models also allow you to use this indoors as well. Although, it doesn’t look as nice as an oscillating tower heater nor is it ideal for using in your bedroom. When deciding upon what electric tower fan heater to buy, you’ll also need to pay attention to the power. The higher the Watts, the more expensive it’ll cost to run, but usually higher Watts means it’ll be more powerful and be able to provide more heat. A good way to decide on how powerful you want the tower heater to be will be to decide whether it’s going to be used to heat up a small or large room. 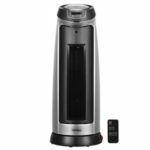 Heat settings – Different heat settings give you the option to have the portable tower heater in a lower or higher heat output which is handy if you get too warm or still feel cold. Power – The Watts is a strong indication of how powerful the tower heater is capable of. Larger rooms or spaces may require a more powerful tower heater, whereas you may get away with a lower Watts heater for smaller rooms. Higher Watts heaters consume more energy and inevitably end up costing more money, however, by using a lower heat setting less energy will be consumed. 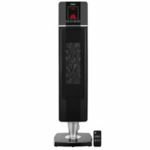 If the portable tower heater will be used in larger and smaller rooms then perhaps buying a more powerful one will be a better option, as when it’s used in smaller rooms, you can always use the lower heat setting. LED display – Allows you to more easily see what settings the tower heater is currently on. Timer settings – Set a timer if you don’t want to get carried away by overusing the heater and running up the energy bill. It’s also ideal if you want to sleep with the heater on but you can set a timer so it’ll automatically turn off once you’re asleep. Remote control – Sometimes when you’re all cosy and comfortable you don’t want to move out of your position, this is where a remote control comes in extremely handy! 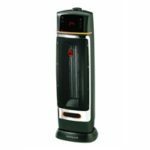 Oscillating – An oscillating tower heater is able to distribute heat to a wider area by rotating within a certain degree. Alternatively, it can be fixed to distribute heat in one area. Ceramic heater – Ceramic tower heaters use ceramic plates to heat up, they are also faster, more efficient and safer than other types of heaters. 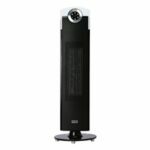 Advantages Of Choosing A Ceramic Tower Heater Over Other Heaters? Portability – Can easily be taken from one room to another, it’s not fixed to any one place, so you can make more use out of it. This also makes selling it or giving it away to a friend a lot easier. Safety – Ceramic heaters has a lower risk of fire because the ceramic parts don’t get overheated. In addition, there are no danger of toxic emissions you would get with a gas heater. Many ceramic tower heaters will also have a safety tip over switch built-in, which will cut off the heating if it’s tipped over. 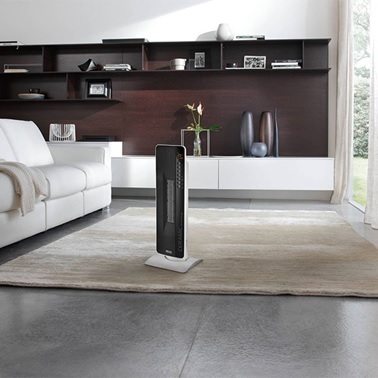 Size – As a tower fan heater is taller rather than wide, it takes very little floor space, so it doesn’t get in the way and also doesn’t take up much space in storage.